Like Pulp miniatures, the problem with basing Inquisitor warbands is that they rarely stick to the same sort of terrain. With pulp games figures move quickly from city to jungle to desert, and back to the city, and likewise in Inquisitor games one could move from Hive to Underhive to a verdant crop world, or an ice world. Bases can already look a bit strange when they match the terrain, and having the figure drag a circle of city around the desert can look even more odd. One solution to this problem is to either base in just black, or possibly even with clear bases, the idea being that very little attention is paid to the base, and more to the figure and the game. This method does pose problems for the other 99% of the time, when your figures are not involved in a game, and are either in a display case or exist merely as pictures online. So it probably makes sense to just base the best you can, with the most common sort of terrain you plan to play on, and just live with it. In my case, since I am also (very slowly) working on Necromunda figures, it makes sense to base Inquisitor figures in a like manner, which is to say a modified Underhive sort of look, with broken terrain bits, some sand, and minimal plant life. On the theme of basing, here are some useful blog posts about it from BigRedBatCave and Toy Soldiers and Dinning Room Battles. Basing III - has a useful method for making multi figure bases. 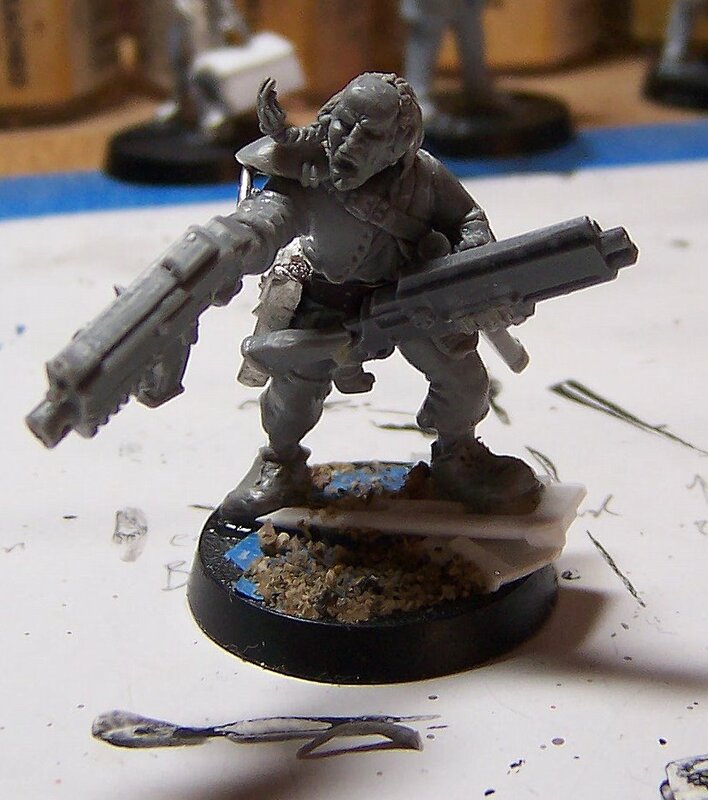 And for something completely different, Orlygg has an old-school basing tutorial. 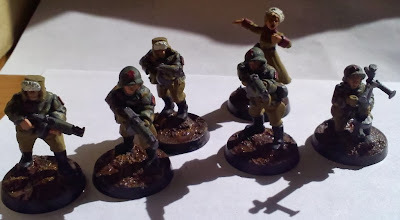 The last couple of weeks, I have been very slowly painting my Copplestone Neo-soviets. These have been partly painted for something like four years, so it was time to get them done. I finally decided I would just go with a camo pattern, and not just wonder about what would be best. Naturally it is completely washed out in the picture, but it is there. I also tried a stamping technique for the base camo color, but ultimately decided it did not work quite right. I really like these figures, and wish they were not quite so expensive so that I could have a reinforced platoon of them [they currently cost around ~$3 a figure shipped, so not terrible, but costs do mount up when you want to get 40ish figures]. Going forward, I plan to add some snow to the bases, and will be using the new GW flesh wash for the first time, so there are a few learning experiences yet to come. 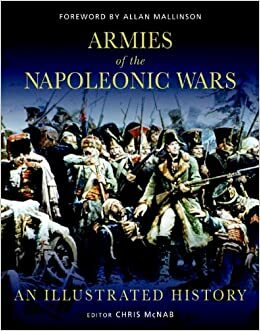 Earlier this week, I finished reading Armies of the Napoleonic Wars: An Illustrated History, an Osprey publication edited by Chris McNab. As is often the case when I am interested in something historical, I gather up some related books for a read, partly as a way to satisfy my interest without spending much if any money, and partly to refine my thoughts on the period as a game. In this case, being recently interested in the Napoleonic period again, I turned to this book, which I got as a gift from my sister a few years ago. When this book was listed by Ospery as forthcoming, there was a great deal of interest on TMP, because it was assumed that this would be a collection of the Men at Arms books from Osprey, with all the text and plates. While it seems unlikely in retrospect that Osprey would take their money making series and provide it in a more economical package, at the time that was the thought, and operating under that assumption, I put this book "on the list" and got it as a gift. Unfortunately, as it turns out this book is more like an overview of the various armies involved and it has very few plates from the relevant MAA books. Most of the text for each country deals with high level organization, which as you might imagine changed quite a bit from 1797 to 1815. There is little in the way of tactical discussion, uniform discussion, or discussion of flags and banners. Someone without a prior understanding of the period, major technologies, and battles, would likely be lost. This book also has all the usual Osprey foibles, such as the reproduction of period color art works in black and white, concentration of strange or unusual uniforms in plates, and deep discussion of rare troop types while the common line infantry are skipped over. Smaller countries get little to no mention in the book, and more discussion of Balkan elements of the French army (and more plates!) than for any of the German states, including the larger ones like Bavaria or Saxony. There is also a bit of editorial bias in this book verging on jingoism, where somehow the peninsular war is the most important theater of battle, but this is common in British texts. So to sum it up, this book was pretty disappointing, both from a wargaming point of view, and from a history point of view. It does have some interesting plates and paintings, and does cover a number of nations, but I think it can only be recommended to those who want an overview of the reorganizations of the various armies, and who do not already own the relevant MAA titles. In the recent Warlord Games newsletter, there was a small item about all individual sprues being 50% off. Naturally I had a look, and indeed, you can get the various reinforcement sprues for very cheaply, making the price of individual figures less than a dollar each. The Bolt Action range of weapon sprues are as cheap as $2, which seems like it would be worth it even for a single gun per sprue, at least in comparison to usual GW bitz prices. I also noticed that they sell Renedra 25mm round bases, which I have had some interest in recently, after seeing them magnetized by Dave King. I resisted putting together an order this time (having recently been on an Ebay binge), but there certainly are some great deals to be had if you need a few figures to round out a regiment, convert, or to use in skirmish games. This weekend I got the new White Dwarf magazine at the FLGS, and I have been fairly avidly paging through it when I have the time. This issue is featuring the redone Dark Elves. Specifically, there are new kits for the basic Dark Elf warrior, Witch Elves, Hydra, and the Cauldron of Blood. Naturally each of those has alternate builds, yielding three types of warrior, two types of witch elves, a hydra or a new monster, a cauldron of blood, or a showcase vehicle for a Medusa type monster. These kits join the earlier, and quite excellent corsairs and cold one knights, and the line will be added to next month with a chariot kit, dark rider kit, and a Executioner/Black Guard kit. Now, as I mentioned in the last post about Dark Elves, I have long wanted a Dark Elf army, and while I am not about to rush out and get one (with several more remaining in boxes and on sprues, I think that my wife might kill me), I do like to list build and fantasize about such things, so I put together a "reasonable" list, and priced it out. Let me preface this by saying that "reasonable" in my mind is heavy on infantry and other basic units, and is over 2000 points. If it gets close to 100 or more figures, I think that is reasonable. Anyway, for my "reasonable" army I got to to approximately 115 figures... and over $600. For a plastic army. Yeah, nothing reasonable about that. Breaking down my imaginary, and now no longer reasonable list, I find that part of the problem is that Witch Elves are $0.50 a point (in the US, ~$0.46 in the UK and undoubtedly more elsewhere). This is not helped by 40 regular warriors at $35 for a box of ten. (10 monopose fixed head figures too btw, which is a significant step back for humanoid figures). Without a battalion box, there is no option to get core troops for less. So no Dark elf army is in the offing, although I might keep an eye out for bitz that I like.